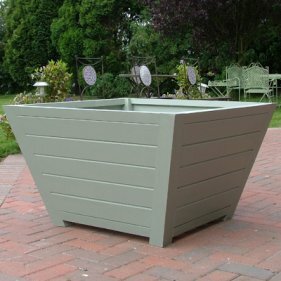 The Blenheim Wooden Garden Planters are large and attractive planters that will add elegance to you garden or patio while providing a home for small trees, shrubs or a displays of seasonal flowers (or a combination of all three). 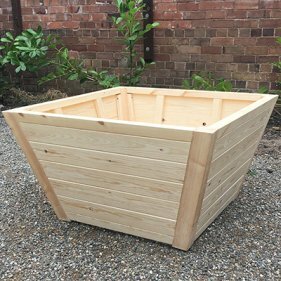 Blenheim Wooden Garden Planters are constructed from Scandinavian Red Pine with 75mm x 75mm corner posts and sturdy cross pieces. 25mm thick infill planks to the sides and 25mm thick slatted bottoms. Finished with Farrow and Ball exterior paint. The internal walls of these planters are now painted with a waterproof paint sealant. scores of fine spray jets. Today, beautiful water features can be created in garden planters, offering both soothing sound and the opportunity to grow a range of marginal plants in planters. The grand French and Italian gardens of the eighteenth century featured stately garden planters, usually in pairs. This classical symmetry survives today found in garden planters paired alongside entrance ways and front doors. Then in the early twentieth century Gertrude Jekyll, the pioneering garden designer, planned rows of garden planters to adorn the elegant terraces of Edwin Lutyen’s country houses.